With Yahoo's purchase of Flickr, it didn't take too long for Yahoo text ads to begin appearing next to Flickr member's pictures. Unlike Google AdWords, Yahoo text ads, at least on Flickr, appear on personal Flickr pages whether or not the member wants them. Granted, Flickr provides the service for free which negates a non-paying Flickr member's ability to completely control what appears on their photo pages but one Flickr user, tanais, doesn't like the practice, commenting on an ad placement next to an image of, we assume, his dog, "I do not like my pictures being used to advertise a specific breeder (they may be excellent they may be terrible - that's not the point)... so I shall sit down and think about how best to AdBust this." 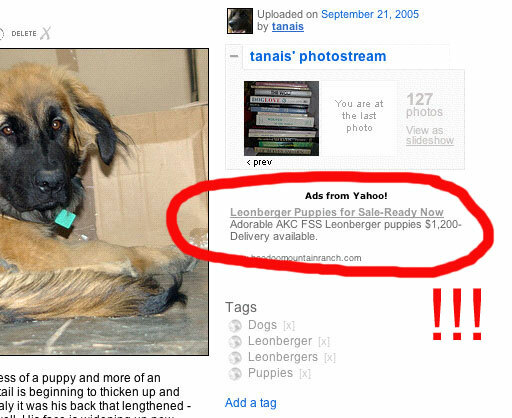 Commenting further on endorsement perceptions which might be created by ads next to Flickr user's image, tanais writes, "I am also made aware of the responsibility one has when one blogs a photo: someone goes 'Awww a Cute Puppy!' Thats to be expected but a picture allied to an advert from a breeder I know nothing about makes me a tad worried. It could be a great breeder for all I know or it could be a puppy mill/farm." And on the inability to control which ads appear on a Flicker user's page, "I find this lack of selective control worrying and I personally disagree with this "adtachment." One could see this as a real issue or one could simply lump it together with the common appearance of ads on individual user's free email account pages such as Gmail, Hotmail or yahoo mail. Or even ads that appear on the free profile pages of MySpace or any other community-like site. Does tanais have a point here or should the member just be happy the ads keep the service free? UPDATE: Commenters claim this has been going on for years. Either they've never appeared on our pages or we've become really good at tuning ads out. I can see both sides of the issue. However, this is a free market and companies that do things that truly offend their users will lose. If Flickr users are offended by the advertising enough tey will stop using it and Yahoo will get less ad revenue. It's in Yahoo's best interest to meet the needs and wants of Flickr users. I assume that if they want to keep users they will begin to add some controls for users. What's this? Ads on a free account? This has been going on for years. How is this news? Wow...we will complain about anything, now won't we? Flickr gives you a free place to put your photos, and you want them to bow to your whim? Buy a pro account, and maybe you will have a point, but until then, go somewhere else. I know, I know... I'm like an atheist crashing an event at an evangelical church, but for crying out loud people, get some perspective! It really gets my goat when people complain about an outstanding service like Flickr, which truly values community and opts to serve UNOBTRUSIVE ads (no shock-the-monkey or pop-up crap). Pro accounts are cheap ($2/month for humungous amounts of bandwidth), the Flickr folks are damn cool people, and the service has a lot of respect for folks' intellectual property and so on. And beyond that... if people are so, ahem, lacking in intellectual prowess as to think that an ad next to your puppy is a personal endorsement from you, then let's just say that our Earth has a lot greater problems to solve than Flickr's use of advertising. Gosh! I never knew this would cause discussion! (I am the user of the flickrspace BTW) and I agree with an earlier comment -- the people are flickr are immensely cool people, if I can guarantee that visitors to my page will not see adverts then that is worth my money. I use Flickr as a great way to share pictures and in my (low-bandwidth) blog. I would not normally mind if the ad was of a thing (e.g. Flickr Tag: "Chicken" points to two rubber chicken advertisers!) no problem with that -- or an earlier iPod Nano piccie pointing people at an iPod accessories shop/MP3 downloads -- again fine. No problem. But lets make this perfectly clear my animals are not products, they are not things -- nor are they accessories, but here the advert appears in a way that does not differentiate between living being and a thing. I've seen too many puppy mills, too many pet farms with sick or diseased animals and while these people advertising next to my pup may be okay, I cannot personally guarantee that in future cases. I do not want to show a picture of a loved, healthy puppy next to a breeder who may or may not be a puppy mill. Its all a question of degree: if it were a thing I'd not worry too much but puppies are not things -- well, not to me anyhoo... I rarely get ranty about much but I am touched that it has sparked some debate. It sounds like Tanais needs to either stop being such a cheapskate or not complain so much. Step it up there Tanais. Time to buy a Pro account. This is ridiculous. It's a FREE account. How do you think Flickr is paying for the bandwidth you are using? If you don't want ads then pony up for a Pro account and stop your bitching. and it can get even worse: i did a post on stray cat trains (don't ask) and what do i get? get-rid-of-stray-cat-solutions. fast and silently even! and no, that is not something that you have to expect with a free account. that would suggest it is okay to promote "mein kampf" while doing a piece on hitler.